Ever heard of a Valentine's day Shrub? This winter bloomer produces a show of red rose, blooms that nearly obscure the plant's foliage in February and March. When no hidden by flowers, the foliage takes on a purple cast adding to the appeal of this lovely plant. If you don't want to try it in your garden, how about potting it in a lovely red ceramic planter and giving it as a gift for the holiday? Easy and unique! 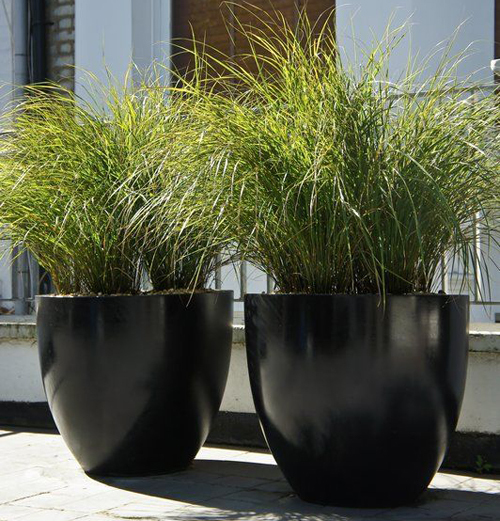 Now is the time to cut back on your ornamental grasses. All winter long they have provided your garden pots with color, and substance. Shear them back before new growth comes in Spring and keep them looking neat and tidy. Once cut back they will start new growth spurts that will conceal the trimmed portion of the plant. Right now is when you want to be thinking about sowing seeds or setting out your transplants of garden veggies. Make sure your pots are cleaned out. 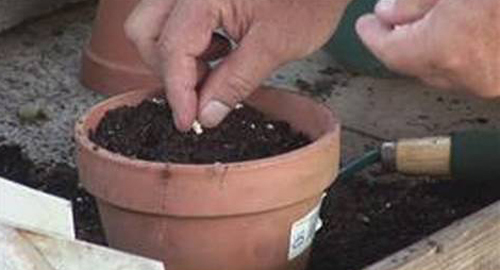 Use fresh potting soil and follow the directions on your seed packets. Planting veggies in garden pots are fun and create a lovely colorful garden that you can have right on your patio. Lastly, if you still have some hardy annuals potted sitting on a porch or patio you must continue to protect them from frost. 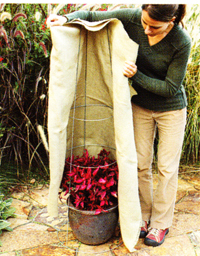 Here we show you have to take a tomato cage and drape it with burlap, sheets, old blankets etc to protect it from the cold elements. Cover at night and remove in the morning so it can get some light and sun. By taking these few cautious steps you can prolong the life of your annuals and keep your garden and patio areas looking lovely. Next Spring and Summer are right around the corner! Read more.....Beyond the basic herbs. Read more.....Know your indoor plants.